I have a love of conventions, and I go to them whenever I can. This is a collection of Convention Reports, Photo Galleries, and Videos I've taken over the years at various cons. Also mixed in are a few personal gatherings that were officially sponsored by TRHOnline. I have decided to stop doing these reports (here's an explanation why), but I'm leaving up the old entries for posterity. For the uninitiated, Daisho Con is an Anime Convention in Stevens Point, WI. Held every November for the last several years, its one of my favorite cons. It's a bit of a trek for us now, but totally worth the drive every time. I've been delaying on this con report for a few weeks, and I'm realizing that I'm not going to have time to get stick figures done for it. So, as this time around I do have a few photos and videos, I thought I'd share with you my 2010 Daisho Con report in more of a mixed media way. Exciting, I know. Geek.kon is a general fandom convention held every year in Madison, WI. It's one of my favorite cons, and since I missed it last year, I was more than determined to make it for their fourth convention. Crysta stayed home for this con, as I was crashing with the No Brand Con staffers and she had no desire to sleep on a floor. That said, join me on my stick figure filled con report for Geek.kon 2010! I help run No Brand Con every year, and unfortunately I was unable to produce either a text or video report for the convention this year as my life had just gotten far too busy (as almost immediately afterwards I moved and got married). What you will find here instead are the plot videos we produced for and released prior to the 2010 convention. As I'm loyal to the town I grew up in, Anime Milwaukee is a convention that I make sure that I attend. It's a convention who's con director is a friend (Hey Momo!) and it's in a town that saw it's old con scene evaporate. That said, it's not a perfect one, and while I always want to love it, Anime Milwaukee is usually only about 90% on target for me. I did have a really good time though, and welcome you to my Anime Milwaukee 2010 con report. MarsCon, the one in Bloomington Minnesota, is the only Science Fiction Convention that I bother to leave the house for. Every year No Brand Con runs a room party there, and for the last several years I've been helping run it. So while it isn't quite the same as any other convention I talk about, it's time for my illustrated Con Report of great Justice! It's time to talk about MarsCon 2010! It's almost exactly six months both since and until No Brand Con, so that means that it's time for Daisho Con! I went to Daisho Con in Stevens Point, WI for their second year, and rather than take a video, I've decided to do an extensive write up the way I used to. It's complete with bizarre stick figure comics as well! 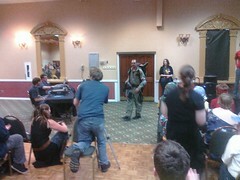 The second half of my No Brand Con 2009 coverage shows a bit more of the stranger side of No Brand Con. Behold some odd moments from the No Brand Con Variety Show. Witness the Cosplayer who won't get off the stage (no matter how hard Duct Tape Boy and I try to usher her off). In the end, a 100% successful convention. Footage provided kindly by Cheesus. I run No Brand Con in Eau Claire, WI. No Brand Con is Wisconsin's Premiere Anime Convention, and we hold it every spring. This year, as I was so busy running around working on stuff, I didn't get to film anything really. Fortunately, Cheesus and Harley were kind enough to send me footage to share with you. For the record, I'm the idiot in the ninja mask. This year, like many years before, a bunch of us from No Brand Con ventured to MarsCon (the one in Bloomington, MN) to run a room party. I didn't get a lot of footage, so this video is fairly short -- but we had a very good time. I went down to Anime Milwaukee 2.5 in... Milwaukee. It's a rather small anime convention and while imperfect, it was still a lot of fun. Needless to say, I brought along the camera and took plenty of footage and edited it down to a nice short video. This last weekend we packed up the big red van of doom and went to Daisho Con in Stevens Point, WI. We went to promote No Brand Con, Sell for Rising Stuff, and perform as Happy Wednesday. Needless to say, we were busy. And we didn't sleep all that much. Crysta and I went and loaded up the red van of doom to take the trip down to Geek.kon in Madison this weekend. We went to vend for Rising Stuff, promote No Brand Con, and otherwise have a fairly good time. I only have a tiny bit of footage, but I've done my best to make it appear at least slightly interesting. We went to Kakkoi|Con 2008 in the Twin Cities to vend for Rising Stuff and Promote No Brand Con with a room party. I had a good time, but it was the sort of event that invites a mixed reaction... as there were some staggering issues. I got like no footage or photos of No Brand Con this year, but on the other hand, Cheesus got the entire Happy Wednesday performance on tape. So, for your entertainment, I present the entirety of Happy Wednesday's Live at No Brand Con Performance. NoBrandCon runs a room party at MarsCon in Bloomington, MN every year, and this one was no different. As I did in 2007, I documented our now mildly infamous Party. All in all, it was a fun time -- except for one crazy person who should never be given the illusion of authority. A bunch of us No Brand Con staffers went down to the first Geek.kon in Madison in October of 2007. Along with the Taeliac Studio crew, we manage to have some fun and look rather silly at the same time on the UW Madison campus. Conventions, as always, are fun. No Brand Con has come yet again, and this time it was bigger and better than ever. No super long play by play this year, but we've got the highlights and some photos for you to look at... so come on in and enjoy. So, a group of us went to MarsCon to run the NoBrandCon themed room party. Last year, problems I didn't mention occurred. Has History Repeated itself? Will the No Brand Heroes survive? Or will the adventure turn out to be the success we had hoped for... read on and find out. For the first time ever, we run S.T.E.A.K. - which is almost like a convention. Sort of. Only not. It's hard to describe, but it sure was a fun time! Or something. Yeah. In anycase, read about my experiences at what turned out to be a surprisingly successful event. This year a bunch of us went to MarsCon in the Twin Cities to promote NoBrandCon 2006. This is the brief tale of what happens when a bunch of guys get into four different cars and attempt to run a room party... it's fairly frightening really... but don't be afraid. It was funn. We gather in Eau Claire once more, to celebrate anime, sell foam swords, and make asses out of ourselves in general. View my entire con report... and then cry a little. The final of our annual January gatherings in Eau Claire for no good reason. We had a grand old time... click if you're curious to see the photos and a bit of information on our idiocy. August of 2002 saw many of us gather in the City of Festivals for it's final hosting of Gen Con (before it moves to Indy). Click to see the photos, and what a good time you missed. We got together for a good time in April of 2002. What? Don't believe me? Take a look at the photos, and a bit of information on the whole event.